What does “text analytics” mean to you and your organization? 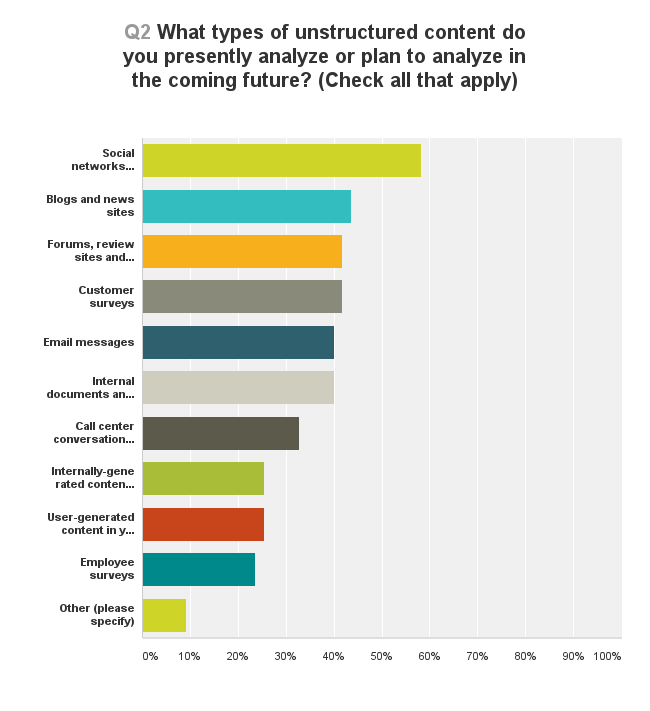 How do you plan to use Text Analytics in 2016? For MeaningCloud, as a text analytics tool vendor, having some answers to these questions is key to understand our market and define our product strategy: this was the purpose of the survey we kept open during some weeks, since the beginning of last October. Even though the number of respondents was quite low (60) it is definitely possible to draw some conclusions and trends that we summarize in this post. What is your text analytics application scenario? No doubt this is the main question when one needs to analyze the uses of this technology. In our results, Understanding customer attitudes, behaviors, and needs was the most mentioned scenario (62%), followed by Research (48%) and Content Classification, recommendation, and personalization (43%) as it can be seen in the figure. The following two categories were Customer service, improving customer experience (40%) and Brand/reputation management (38%), which means that everything related to customer understanding, improving customer experience, and managing the brand lead the text analytics application area, coping 3 of the 5 first positions. Social networks? News? Internal records? 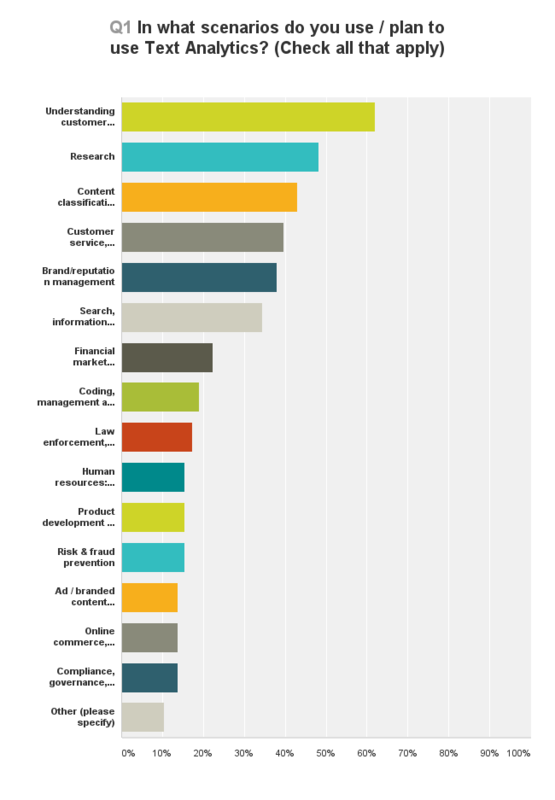 What sources of unstructured content do you need to analyze? This is also a hot topic related to text analytics. As we can see in the figure, external content (social networks, blogs, news, forums…) essentially user-generated, is king. Curiously, even the most frequent internal content (i.e. owned by the organization) to be analyzed has an external origin as it consists of customer surveys. Results: Social networks (Twitter, Facebook, etc.) (59%), Blogs and news sites (44%), Forums, review sites and online communities (42%). This is again a confirmation that social media is one of the drivers of the adoption of text analytics technology. Trend discovery: detecting new and unexpected themes in a market or community (a function closely related to one of our last product launches, the Text Clustering API, and that will be complemented by coming developments we have in the pipeline). Pre-configured models and dictionaries for different industries and applications, e.g. banking, pharma (again, a functional area where we’ll be announcing news very soon). In short, two features that accelerate the time-to-benefit of these tools. Finally, the survey aimed at profiling the professional characteristics of text analytics users and of the companies for which they work. The results were that most of them work for a company with established products (54%), as opposed to start-ups, and in companies between 2 and 200 employees (54%). The departments were these people mainly perform their jobs are: Research and Development, Product Management (45%) and Marketing, Sales, Business development (16%). These responses are consistent with the main application areas of text analytics. And finally, the main use that they give to text analytics is to provide products/services to external customers (61%), as opposed to serving internal processes and users. Most of these conclusions have not been a surprise to us, as they tend to be recurring themes in our conversations with customers. And obviously, we’ll try to accommodate the requested features & functions in MeaningCloud’s roadmap. Stay tuned! And if you haven’t registered in MeaningCloud don’t forget to give it a try.